The Road to Omaha doesn't begin in the spring; coaches already are driving their players toward the College World Series. It's the rise-n-grind that players tweet about; it's the workout pictures that are shared on social media. It's the day-in, day-out work that coaches and players hope will separate their team in June. Before the first pitch in February, NCAA.com is highlighting teams that may reach the Mecca of college baseball: Omaha. 1. What can fans expect from this squad in 2015? Strong pitching staff returns after setting the school's ERA record last season. 2. What is the one thing that this year’s team does best? Pitching and defense. 3. Bottom of the ninth, tied game, two outs, winning run on second … which player does this team want to step up to the plate? Senior outfielder Casey Fletcher. He had consecutive walk-off hits in 2014. 4. If this team had one game to win, which pitcher would get the ball? Junior left-hander Kevin Duchene starts and junior left-hander Tyler Jay closes. 5. Who are we most likely to see make a "SportsCenter Top 10" play on this squad? Senior outfielder Will Krug. 6. What does Omaha mean to this team? 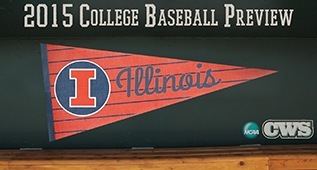 Reaching Omaha is Illinois’ ultimate team goal. It drives everyone to want to reach TD Ameritrade Park to play on the biggest stage in college baseball by being dedicated and working hard to become the first Illinois team to make it there. All of the hard work that the team puts in year round leads to the pinnacle of what college baseball is all about. We're ready for the big stage and all we have to do now is perform.